Preferred Habitat: Woodlands and brushy fields. 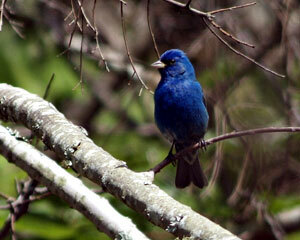 Notes: The Indigo Bunting is particularly common in our area in the spring. Males are readily identified by their dark blue plumage. Females are a soft brown with blue patches on the tail. 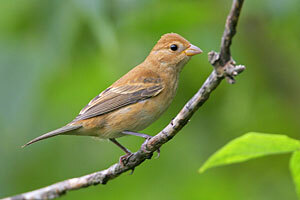 Buntings along with Tanagers display complex molting patterns. In the fall male adult Indigo Buntings resemble females. Varying degrees of blueness may be observed. Indigo Buntings are sometimes seen feeding on lawns and make use of bird feeders.